To all aspiring graphic artists out there, this one’s for you. Don’t get discouraged if your first attempts aren’t as good as you would like, we learn by doing. This is one of my first Cafepress designs. The original design was done using wingdings for the book, cross, Star of David, and Crescent and Star designs. 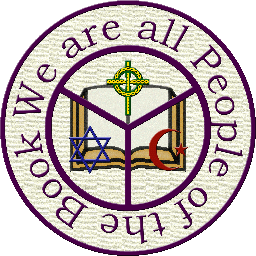 The peace symbol was created using simple vector graphics, and the We are all People of the Book lettering was created in Word Art. This simple design actually proved popular, so I created a second version using what I’ve learned over the past year. I had made a Celtic Cross design, so I put that in the place of the cross wingding. The book, Star of David, and Crescent and Star designs I saw no reason to not use. 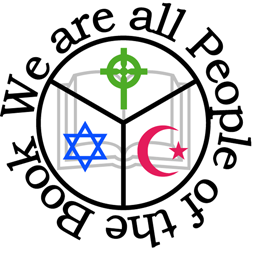 I made a peace symbol in Illustrator, placed the book behind it, the other symbols within it, and used Text on a Path for the lettering. Then I took the whole thing into Photoshop, applied colors, and put a masked background of cream linen behind the whole design. The original design is still available.